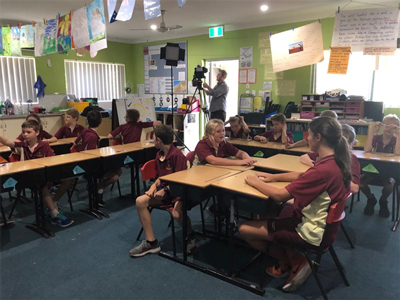 While it's a subject typically reserved for tertiary students, one Central Coast primary school is embarking on a world-first new pilot programme aimed to educate students in public relations. Holy Cross Catholic Primary School has launched the pilot in recognition of the uptake and implications of technology by young people. With as many as 95 per cent of eight-to-eleven year old's accessing the internet1 and close to one in two accessing social media, children are taking on the 'adult world' and building and promoting their personal brand without even realising. The Public Relations course aims to equip them with knowledge that preserves and enhances their reputation. Craig McNee, Principal, Holy Cross Catholic Primary School, Kincumber said, "It's easy to focus on the negative aspects of technology, however we want to take an alternate view and empower our students by educating them on the behaviours and actions that can lead them to a positive reputation." The course was initiated and designed by PR expert and founder of InsideOut Public Relations, Nicole Reaney, who observed the challenges devices and online interaction would have on young people. "The reality is, the adoption of technology by young people is not going to go away – and while yes there are risks, there are also positives to this societal shift. It's important the conversation moves away from 'technology' and into education that prevents young people from compromising their image," said Nicole Reaney. "Taking the right steps early on and fostering a clean digital footprint, will reduce reputational risk and propel children in their personal, schooling and professional lives – from friendships, wellbeing, jobs, relationships and careers," she adds. The course will provide students with an understanding of personal brand, the behaviours that can lead to positive and negative reputations; and will also cover interactions with peers offline and online to minimise bullying and promote cyber-safety. "Holy Cross Catholic Primary, Kincumber has always been forward-thinking in its curriculum and the adoption of this programme is a wonderful example of this," John Hession, Education Officer: eLearning, Catholic Schools Office, Broken Bay, NSW. The pilot programme will be delivered in a session to students in year 6 within a fun, relatable and interactive learning environment. Question: How has this subject been adapted considering it is typically reserved for university students? Nicole Reaney: Absolutely – it's fun, interactive and relatable to situations they may need to navigate through at their age. Question: What will students enrolled in the Public Relations course learn, throughout the year? Nicole Reaney: At this stage it's a single introductory course – 1.5-2 hours. Question: What advice do you have for students in regards to fostering a clean digital footprint? Nicole Reaney: The key principles surround honesty, being mindful of words and photos, supporting peers, focusing on their own talents and skills and avoiding situations that could compromise their image such as steering clear of bullying. Question: How can parents help educate their children about the importance of protecting their personal brand? Nicole Reaney: We also include some guidelines for parents as part of the programme. Essentially it's important that parents are across their child's online activity and also recognise their own online behaviour.